$ km95 1 Rupee (1993) Inter Parliamentary Union Conf. $ km336 5 Rupees (2004) Lal Bahadur Shastri, 9 g., Stainless Steel. 23 mm. $ km336a 5 Rupees (2004) Lal Bahadur Shastri, 6.0300 g., Stainless Steel, 22.9 mm. $ km329 5 Rupees (2004) Lal Bahadur Shastri 9.07 g.
$ km325 5 Rupees (2005) Dandi March, 8.85 g., Copper-Nickel, 23 mm. km365a 5 Rupees (2005) Dandi March, 6.0300 g.Stainless Steel, 22.9 mm. $ km355 5 Rupees (2006) Narayana Gurudev, 9.5 g.. Copper-Nickel, 23.1 mm. $ km355a 5 Rupees (2006) Narayana Gurudev, 6.0300 g.. Stainless Steel, 22.9 mm. 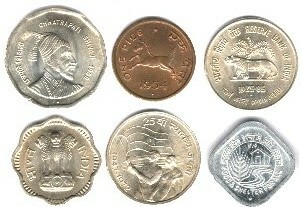 Click here to view all modern rupee designs. Click here to view all other modern coins.